Each act of being aware of your breathing can bring changes to your body and mind. For example, during exercise and working out, good trainers will tell you to breathe. As a musician and educator, each day and each lesson includes breathing awareness and development. However, I want to keep this short, so here is an acronym with some notes. B: Breathe. In, then out. In, then out. Once more – in, then out. R: Respire. It’s another word to describe breathing. From this, we get: Inspire and Inhale. Expire and Exhale. Inspiration – and Expiration – are both necessary for Life. Think about that. 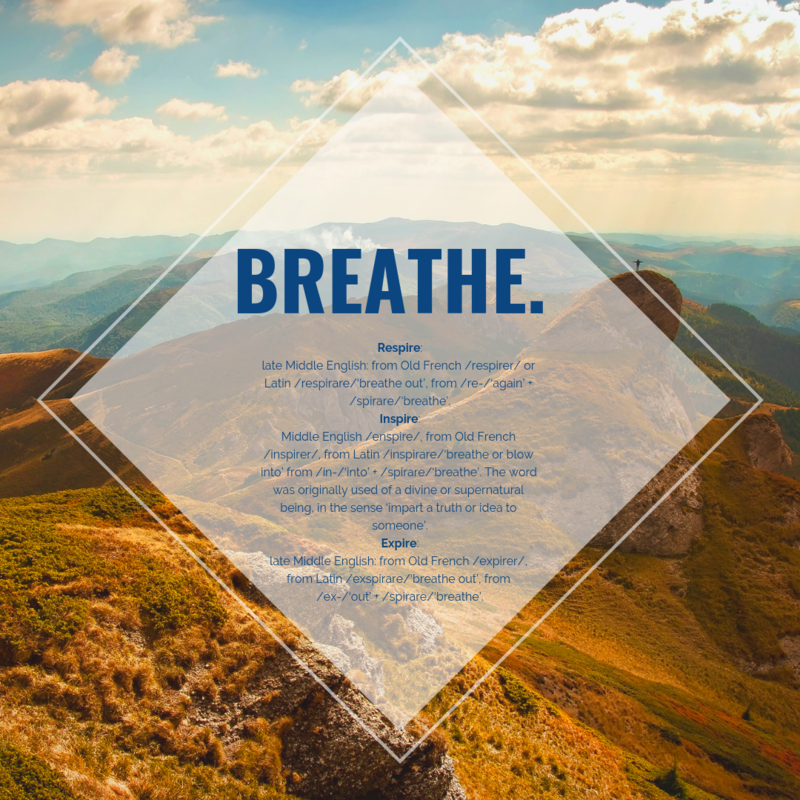 E: Exhale: Again, expiration – exhaling – is necessary for life. A: Aware: As often as you can, be aware of your breath. Go through this checklist. T: Time yourself. If you have a little longer, count your breaths. A simple start is 4 counts in, then 4 counts out. When you’re comfortable with this, either add a pause between then in and out or extend the length of your inhalation and exhalation. H: Health. Breathing is an incredibly necessary part of health. Often – and rightly – we focus on nutrition and exercise. How often do we consider breathing? It used to be said we only used 10% of our brain – experts tell us that newborn babies know how to breathe naturally and normally, but once we grow into the stresses and strains of life, we start to learn bad habits of breathing. E: Environment. Consider your environment – from the quality of the air you breathe, to where you sleep, and what forms of exercise you take – and how all of this connects to your breathing. late Middle English: from Old French /respirer/ or Latin /respirare/‘breathe out’, from /re-/‘again’ + /spirare/‘breathe’. Middle English /enspire/, from Old French /inspirer/, from Latin /inspirare/‘breathe or blow into’ from /in-/‘into’ + /spirare/‘breathe’. The word was originally used of a divine or supernatural being, in the sense ‘impart a truth or idea to someone’. late Middle English: from Old French /expirer/, from Latin /exspirare/‘breathe out’, from /ex-/‘out’ + /spirare/‘breathe’. What else is happening this week on Hybrid Consonance?